Nosgoth, the upcoming third-person multiplayer game for the PC, takes place in the world of Legacy of Kain, in a time where humans were rebelling against their vampire slavers. As the team behind Mass Effect 3’s multiplayer as well working on Bulletstorm, Gears of War and XCOM: Enemy Unknown, Psyonix have built plenty of multiplayer experience. This upcoming free-to-play game sets human and vampire factions against each other and each team plays a round as each faction. As squishy humans, you obviously don’t want to get close enough for vampires to bite you, so the human weapons are all built around ranged attacks. Vampires specialise in melee (strangely enough) using their natural abilities to crush the puny revolution. In each arena, humans can heal at fountains spread around the map while Vampires must down and consume a human to regain health. Each character wields a weapon, two abilities and a perk. You can set up multiple loadouts for different situations and as you rank up, you’ll earn new abilities and more weapons. Psyonix are adamant that this won’t be a pay-to-win game. They’re looking towards eSports for the future of the game, where benefiting players with money simply doesn’t make for an enjoyable sport. You’ll be able to buy XP boosters to accelerate your levelling but there will also be gear available for purchase as well as in-game trading. Right now, items available in the beta include a grappling hook that allows the human scout to climb walls, weapons with special properties and new abilities for each class. There are also perks like extra health and cosmetic skins to change your appearance. According to Bill Beacham, the game’s design director at Square Enix, they don’t currently have plans to create a real-money trading system. Using the in-game trading and currency, you’ll be able to buy weapons to better suit your playstyle but every benefit will come with some form of penalty. The example given by Beacham was in buying an improved crossbow. “If we do our job right, there’s no weapon in the game, there’s no ability for the vampires, there’s no ability for humans that gives you an advantage. When playing as the humans, I learned that teamwork is critical, no matter what level your opponent. The vampires can climb up walls, knock you over with powerful charges or, in the case of the reaver class, leap huge distances and go straight for the kill. One-on-one you’ll barely stand a chance but stick together in a defensible part of the map and you should be able to take out the vamps before they reach you. 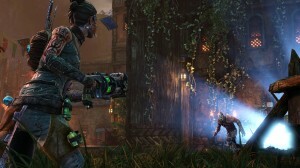 Reaver: This character moves quickly, with the ability to dodge incoming projectiles and throw smoke bombs to blind humans. His pounce makes him a danger from a longer distance than most. 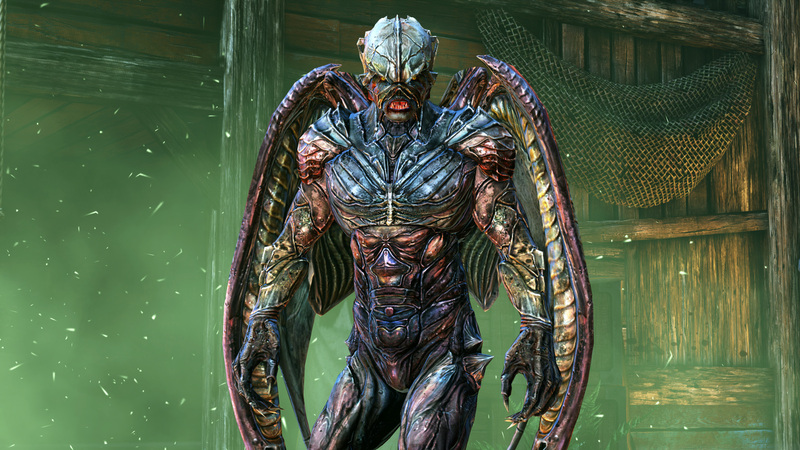 Sentinel: This flying vampire can seize an unprotected human and drop them from a great height. Bloody difficult to target in the sky as well. Tyrant: As the blundering charger, the Tyrant can take a lot of punishment while bowling humans over. He also has an AoE ground slam and can toughen his skin to reduce damage for a time. Deceiver: This new class was released only last week to those who’ve earned the unlock and can create illusory copies of himself that will attempt to attack nearby humans. More disturbingly, he can also disguise himself as a human teammate, running alongside you until he stabs you in the back. The humans currently have three available classes in the closed beta, with a fourth on the way soon. Scout: Armed with a bow, these players are your traditional snipers. Get up high, pick off your targets from a distance. Alchemist: Wielding a “hand cannon” which is essentially a shotgun, the alchemist’s abilities are vials (or grenades) that explode on impact. Hunter: Carrying a rapid-fire crossbow, the hunter’s most effective (read: annoying) ability is the bola. These weighted chains can stop a vampire in its tracks, disabling their abilities and giving your team time to take them out. The humans will also be getting a fourth character, the prophet. According to the lore, the prophet is a mad priestess who drink from the blood fountains to maintain her powers. She carries a pair of powerful revolvers and focuses on helping her team-mates. “She’s a witch, said Beacham. “She’s a user of dark, horrible sacrificial blood magic. She’s got these twin multiple-barrelled primitive flintlocks. We always had this idea of a class that was a bit – she’s a buff/debuff class. that’s the role she plays. She helps her team-mates. She screws with the enemies by curses and hexes and shooting. 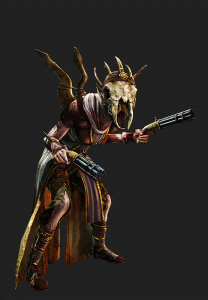 As for her design, the prophet doesn’t quite look human in the heat of battle. “We wanted to make a female class in a fantasy game that wasn’t just… what you see in other fantasy games,” continued Beacham. “Chainmail bikinis for the win, you know. And there have been conversations about whether that [chainmail bikinis] would sell. And it would. Probably. To a certain audience, yeah. “But it didn’t feel right for the kind of game that we wanted to make with Nosgoth. There have been quite sexualised characters in some of the other [Legacy of Kain] games, we’re aware of that. Nosgoth will be free to play on PC. You can sign up for the closed beta on the official website.